The C1D gene is expressed in a broad spectrum of mammalian cells and tissues but its product induces apoptotic cell death when exceeding a critical level. Critical levels are achieved in a fraction of cells by transient transfection with EGFP-tagged C1D expression constructs. However, transfected cells expressing sub-critical levels of C1D(EGFP) escape apoptotic cell death by activation of a proteasome-mediated rescue mechanism. Inhibition of the proteasome-dependent degradation of the C1D(EGFP) protein results in a parallel increase of the intracellular C1D level and in the fraction of apoptotic cells. The C1D gene encodes a conserved DNA-binding protein  which is expressed in all eukaryotic cells and tissues tested . However, the physiological level of this protein must be tightly regulated because additional ectopic expression induces apoptotic cell death . Previous studies showed that the C1D protein can serve as a DNA end-independent activator of DNA-PK  and that its overflow is paralleled by increased p21Cip1(Waf1) levels . Accordingly, the C1D protein represents a cryptic activator of apoptosis, and its over-expression could be applied to induce apoptosis in non-desired cells, e.g. in tumor cells. Accordingly, approaches resulting in increased levels of this protein are of interest. This study shows that the vector-based overflow of the C1D protein can be significantly enhanced by inhibition of the proteasome-dependent degradation system. Ectopical expression of the enhanced green fluorescent protein (EGFP) in Ehrlich ascites cells does not cause any significant impairment of cellular parameters, e.g. viability and growth . Transiently transfected cells exhibit variable fluorescence intensities over a broad range and the level of expression observed in individual transfectants appears to be primarily dependent on the introduced plasmid copies per cell. Moreover, the fraction of cells expressing EGFP is high and the level of expressed EGFP remains high over prolonged observation periods, e.g. 120 hours (Fig. 1). The persisting high level in transfectants indicates that the innoxious EGFP does not stimulate any specific degradation mechanism. A moderate decline in the number of fluorescent cells at about 48 hours post transfection reflects the expected proliferation-dependent dilution of EGFP-encoding plasmids in transiently transfected cells. Persistence of ectopically expressed EGFP, and instability of C1D(EGFP). Percentage of cells exhibiting fluorescence following transient transfection of cultured EAT cells side by side with 20 μg pcDNA3-EGFP or with pcDNA3-C1D(EGFP), respectively. The fraction of cells with significant EGFP-depending fluorescence remains high over the entire observation period (24–120 hours post transfection) while the number of cells with C1D(EGFP)-depending fluorescence is lower at 24 hours, and declines rapidly at 72–120 hours post transfection. In contrast, a bi-modal distribution of fluorescence intensities is observed following transfection with the CMV promoter-driven construct inducing ectopical expression of the C1D(EGFP) fusion protein. A fraction of transfectants exhibits extremely high fluorescence (Fig. 2) while a larger fraction of cells shows significant but much weaker fluorescence (Fig. 3). In highly fluorescent cells the fusion protein accumulates in dense intranuclear spots while plasma vacuolization, membrane blebbing, nuclear segmentation, and cell lysis are further steps in cell death. The size of this cell fraction depends on the plasmid concentration applied and on the promoter strength of the expression construct, e.g. the SV40 promoter-driven expression construct pJ3Ω-C1D(EGFP) results in generally smaller fractions of apoptotic cells which indicates that a critical level of C1D(EGFP) is required for the production of Figure 2-type cells. The fraction of transfectants exhibiting significantly weaker fluorescence (Fig. 3) is generally larger, and cells of this fraction show no symptoms of apoptotic cell death. Importantly, 120 hours post transfection all cells of the culture are devoid of C1D(EGFP)-dependent fluorescence while cells transfected with the plasmid encoding only EGFP show still high fluorescence at this time (Fig. 1). Transfected and apoptotic cells. 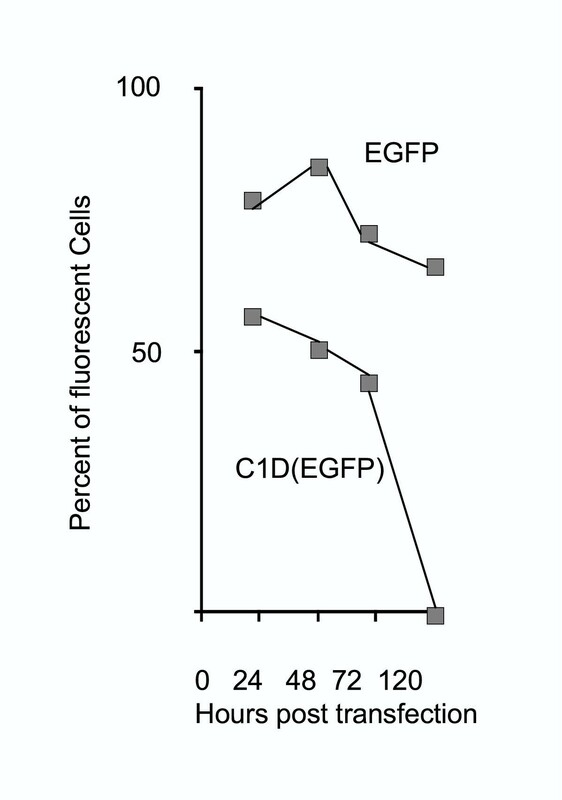 A fraction of cells exhibits extremely high C1D(EGFP)-dependent fluorescence when transfected with pcDNA3-C1D(EGFP). Cells belonging to this fraction can be distinguished by morphology and short exposure times required to capture 510 nm fluorescence mode images (about 100 milliseconds). 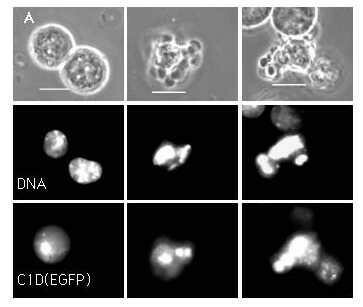 Upper row: phase contrast mode; second row: DNA-specific fluorescence (456 nm); third row C1D(EGFP)-specific fluorescence (510 nm). Bars represent 10 μm. Transfected but non-apoptotic cells. A fraction of cells exhibits weak and rather uniform fluorescence when transfected with pcDNA3-C1D(EGFP). Cells of this type can be distinguished because exhibiting undisturbed morphology, and much longer exposure times are required to capture 510 nm fluorescence mode images (2–3 seconds). Left image: phase contrast mode; right image C1D-EGFP fluorescence (510 nm). Bar represents 10 μm. The complete disappearance of fluorecent cells at 120 hours post transfection is only partly due to cell death of those cells exhibiting the morphologies shown in Fig. 2 because the drop in the number of fluorescent cells is not accompanied by an adequate drop in the total number of cells (not shown). Accordingly, cells expressing subcritical levels escape apoptotic cell death because they appear to be capable to induce a rescue mechanism which prevents overcritical C1D(EGFP) levels. Obviously, this mechanism is fully induced at 120 hours post transfection (Fig. 1). At this time C1D(EGFP) degradation overrides expression of this protein resulting in normally growing cells devoid of fluorescence. These results are best explained by a point-of-no-return mechanism in C1D-dependent apoptosis signalling. Overcritical C1D protein levels are expectedly achieved in those cells with an initially high number of plasmid copies per cell. In this case, the C1D(EGFP) threshold level is presumptively exceeded and apoptosis is inevitably induced while cells with a lower number of plasmid copies per cell expressing only subcritical C1D(EGFP) levels still remain capable to activate a C1D-directed elimination mechanism. Complete elimination of the cytotoxic C1D(EGFP) from cells expressing significant but subcritical levels is apparently mediated by the ubiquitin-proteasome system. Treatment of transfected cultures with the proteasome-specific inhibitor MG115 results in an increase in the total number of cells exhibiting extremely high fluorescence (Fig. 4), and in the overall level of expressed C1D(EGFP). Quantitative fluorescence microscopy performed by means of the 'Openlab Measurement Module' points to a 7.5 fold increase of the overall fluorescence in transfected and inhibitor-treated cultures when compared with transfected cultures in the absence of the inhibitor. 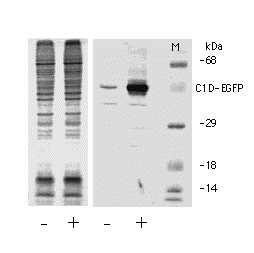 The significant inhibitor-induced increase of expressed C1D(EGFP) is also shown by Western blotting (Fig. 5). 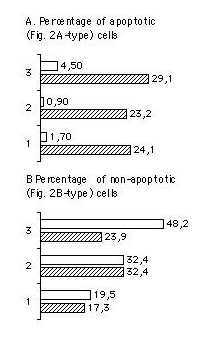 Concomitantly, the fraction of apoptotic cells exhibiting the morphologies shown in Figure 2 becomes significantly increased while the fraction of transfectants expressing subcritical C1D(EGFP) levels remains either unchanged or becomes reduced (Fig. 4). These results indicate that the effect of the proteasome-specific inhibitor MG115 is correlated with higher intracellular levels of C1D(EGFP) and with a significantly higher fraction of Figure 2-type cells. MG115 inhibitor-dependent increase of apoptotic cells. pcDNA3-C1D(EGFP)-transfected cultures were split at 8 hours post transfection and either not supplemented (blank columns) or supplemented with the proteasome-specific inhibitor MG115 (10 μM) (hatched columns). Microscopical fluorescence analyses were performed 24 hours post transfection. Increased levels of ectopically expressed C1D(EGFP) in the presence of the proteasome-specific inhibitor MG115. Cells were transfected with pcDNA3-C1D(EGFP). The culture was split at 8 hours post transfection, and incubation was continued (16 hours) without (-) or with (+)10 μM of the proteasome-specific inhibitor MG115. Lysates of cell pellets with identical cell numbers were submitted side by side to 12% SDS-polyacrylamide gelelectrophoresis. Parallel lanes were either stained (left) or electroblotted to nitrocellulose which was immuno-stained by means of the monospecific C1D antibody , and 125Iodine-labelled anti rabbit Ig. The autoradiograph of the blot is shown together with the positions of prestained marker proteins. The main autoradiographic signal corresponds with the molecular mass of the C1D(EGFP) fusion protein (43 kDa). The C1D portion of the fusion protein must be considered to comprise the decisive signal for the proteasome-mediated degradation because the level of ectopically expressed EGFP is only weakly increased in the presence of MG115, and MG115-induced degradation is also not a general characteristics of EGFP-tagged proteins. For instance, the level of the apoptosis-related ZIP-kinase-EGFP  is not significantly increased in the presence of the MG115 inhibitor (not shown). Inhibition of proteasome-dependent proteolysis favours apoptotic cell death by increasing gene products considered to be involved in apoptosis signalling [5, 6]. Examples for apoptosis-related gene products upregulated by proteasome-specific inhibitors include p53 [7–10], p73 , p21Cip1(Waf1) [12, 13], p27Kip [12, 14], and caspases [15, 16]. Our results indicate that the C1D protein must be added to this list of factors. Physiological levels of the C1D protein are apparently innoxious and rather essential for cell viability. However, a critical overexpression is not tolerated with the consequence of apoptotic cell death . Consistently, C1D expression is tightly regulated on the transcriptional and on the posttranscriptional level. The promoter activity is repressed by cis-acting sequences comprised in a LINE-1 upstream element , and proteasome-mediated degradation appears to avoid accidental protein levels. Consequently, a critical C1D(EGFP) level is only achieved in a relatively small fraction of cells suggestively transfected with a high number of plasmid copies per cell. In contrast, transfectants initially expressing subcritical levels of the cytotoxic protein have the capability to override the ectopical overexpression of the cytotoxic protein by activation of a proteasome-dependent mechanism which degrades C1D(EGFP). Consistently, inhibition of the latter process results in a shift towards higher yields of apoptotic cells. The concomitant inhibition of the degradation of other apoptosis-favouring proteins [7–16] may contribute to this higher yield of apoptotic cells. Survival of tumor cells is in all or in part due to their inability to activate the programmed cell death . Accordingly, factors with the characteristics of C1D are of interest with respect to the elimination of nondesired cells, e.g. tumor cells. It is concluded that the yield of apoptotic cells is significantly increased by vector-dependent C1D expression in combination with inhibitors of the proteasome-dependent degradation of the C1D gene product. The preparation of C1D(EGFP) expression constructs are described elsewhere in detail . Briefly, the PCR-amplified sequence encoding the murine C1D protein (X95591) was fused with the sequence encoding EGFP (Clontech) in the pBluescript KS+ vector (Stratagene). The fused C1D(EGFP) sequence was excised with suitable restrictases and recloned either in the CMV promoter-driven pcDNA3 vector (Invitrogen) or in the SV40 promoter-driven pJ3Ω vector . The sequence encoding the ZIP-kinase  was assembled from coding fragments present on ESTs (IMAG 457285, IMAG 386126) which were received from the 'Ressourcenzentrum im Deutschen Humangenomprojekt'. Fusion with the EGFP-encoding sequence and recloning in the pcDNA3 vector was performed as described for the C1D sequence. For controls the EGFP-encoding sequence was recloned in the pcDNA3 vector. Ehrlich ascites tumor (EAT) cells grown as described elsewhere in detail  were transfected with Qia-tip (Qiagen) purified plasmids by electroporation using the Biorad Gene Pulser II (cell density 107 per ml, electrode distance D = 4 mm, 366V / 950 μF). For detection of proteasome inhibitor effects the medium of exponentially growing transfected and non-transfected cells was supplemented with MG115 (benzyloxycarbonyl-leu-leu-norvalinal, Calbiochem) to obtain the final concentrations mentioned in the legends of Figures 4 and 5. EAT cells were lysed in 2× sample buffer containing 5% β-mercapto ethanol at 95°C. Aliquots corresponding to a defined number of cells and prestained marker proteins were submitted to SDS polyacrylamide (12% w / v) gel electrophoresis. Gel lanes were electro-blotted to nitrocellulose membranes, blocked (PBS / 1% BSA), and probed with C1D antibodies preadsorbed at recombinant murine C1D protein . The second antibody was 125Iodine-labeled anti rabbit Ig (Amersham). Blots were exposed to Kodak X-Omat film and images were captured by means of an electronic camera (Herolab). The Openlab imaging sytem (Improvision, Warwick, UK) was used to capture images. Cells were collected, washed with phosphate-buffered saline (PBS), counterstained with Hoechst 33342 (0.1 μg per ml), resuspended in Hanks' balanced salt solution (HBSS), mounted on glass slides and inspected by microscopy. The 'Measurements Module' was used to measure mean fluorescence intensities per cell in regions of interest (ROIs).